"A moist and nutty cake that keeps and freezes well. Frost with your choice of frostings. Some suggestions are: Cream Cheese Frosting, Whipped Cream or White Buttercream." Preheat oven to 350 degrees F (175 degrees C). Grease and flour a 9x13 inch pan. In a medium bowl, stir together the sugar and apples, set aside. Sift together the flour, baking soda, cinnamon and salt. In a large bowl, stir together the oil, eggs and vanilla. Add the apples and sugar, mix well. Stir in the dry ingredients, then the nuts. Pour into the prepared pan and spread evenly. Bake in the preheated oven for 45 minutes, or until cake springs back to the touch. Quick, moist and delicious apple cake. This recipe makes 6 mini loaf cakes. They turned out very moist and delicious, and they froze and thawed very well. Using them for the upcoming holidays for homemade gifts for family and friends. YUMMY!!!!!! I ADDED 1/8 TSP. EACH OF CLOVES, NUTMEG, AND GINGER IN ADDITION TO THE CINNAMON. SPECTACULAR CAKE. I WILL DEFINITELY MAKE IT AGAIN. This was excellent. The batter is very thick. Will try with 1/2 cup less sugar next time. I grated the apples. Used the caramel glaze from Fresh Apple Cake III. 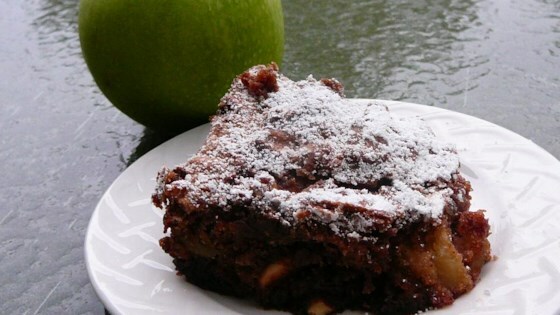 this recipe was the moistest apple cake i had ever made yet.it is delicious and very simple to make.my family loved it and so would yours.you must try this recipe!